Fresh Mackeral 250 grams, debone and cut into preferred size. 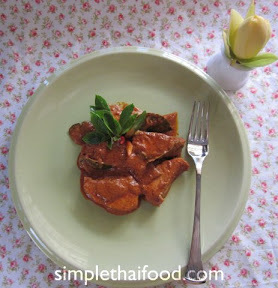 Red Curry Paste( Panaeng( thai) curry paste) 100 grams. Lime leave, a few, clean and shred. Season with Palm Sugar and fish sauce. Be Careful with the Fish Sauce because the fresh curry paste is often salty, sometimes you would not need more fish sauce. 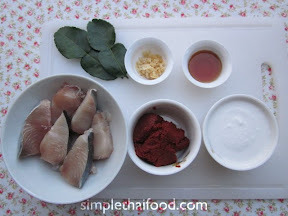 When you get the preferred taste, add fish meat into the curry and let it cook for 5 Minutes, so the curry and be absorbed in the fish meat. Before turning off the gas add the shredded lime leave. Garnish with sweet Basil and chili while serving. There are many different kinds of curry pastes available in the market. Green, Yellow, Red are most commonly available kinds of pastes. Each one tastes different – one spicier or saltier than the other. Among the red curry pastes, there are Gaeng Ped (spicy curry), Gaeng Panaeng (my favorite) , and Gaeng Chu-chi. You can see what is written on the label of the red curry paste, and choose as you like. Be careful with Fish Sauce. While making this curry, I thought 2 teaspoons full of sauce would be enough, but it turn out to be a little more salty. Hence, I had to add more coconut cream than I planned (2 cup instead of 1) to tone down the saltiness. Thanks for your comment. Do keep coming.